Is there a reverse auteur theory? If there is, I fear Danny Boyle may have succumbed to it for his films get less interesting the longer he works. The new example is 127 Hours, which does feature a very good performance by James Franco, but Boyle directs it as if, at worst, he was on a cocaine binge during its filming or, at best, he thought it should be made for people who suffered from severe ADHD. While mountain climbing in Utah, he slipped in a crevice, trapping his right arm between an immovable boulder and the mountain. Isolated, with no way to get help (any screams went unanswered and, for some reason, he thought his video camera was more vital as equipment than a cell phone) and dwindling supplies of food and water, Ralston managed to free himself after the amount of time in the title by using a tiny knife to sever his arm from his body. Truly, Ralston's tale makes for an inspiring study in survival, self-preservation and the will to live at any cost. As a film however, I'm not sure that this would really make that gripping a movie, especially as well known as the story is. What is certain is that Boyle's directorial approach makes it worse and borders on being unwatchable. Given that this is a story about a man trapped in a relatively small space for a long period of time, you would think a director might want to build suspense, especially since he's compensating for a well-known event, by emphasizing the claustrophobia and desperation of Ralston's situation. Boyle goes in the opposite direction: His camera never sits still, constantly zooming and jumping, tilting to angles more often found on the 1960s Batman than in a grim 21st century story of against-the-odds survival. He also employs lots of split and tri-split screens for no apparent reason, taking every opportunity he can to show Franco from every point of view he can muster. On top of that, this movie, especially in the opening sequence and again later, may be a triumph of product placement unequaled since Harley Davidson and the Marlboro Man. At some point, it becomes clear that Boyle isn't doing this because it's the best way to serve the story and the film at that moment but because he's just bored silly. When there were early reports of people supposedly fainting at showings of this film, I don't think it was because of the scenes where Franco's Ralston gets around to cutting off his arm, I just think they all had sea sickness minus the ocean. What in the world has happened to Boyle as a filmmaker? He started out so promisingly with films such as Shallow Grave and Trainspotting. Sure, A Life Less Ordinary was a misfire, but I thought The Beach was underrated and he followed that with the great 28 Days Later. Then, things definitely started their slide. Millions wasn't without its charms, but it was slight. Admittedly, I never saw Sunshine, but nothing I heard from anyone who did convinced me I was missing anything. Then came the overrated Slumdog Millionaire, with its hyperactive subtitles and mostly downbeat story that would, of course, end with a joyous Bollywoodesque dance number. It was so over-the-top at times and overpraised, naturally it was showered with Oscars. 127 Hours doesn't contain subtitles, but it does contain words at the end to tell you what happened later, but he bounces those all over the screen too. What's worse is that they are in white type and they don't take into account what images they place them on so many words can't be read because they bleed into the background. Two things that save 127 Hours from not making you want to either turn it off, walk out or ingest large doses of Dramamine are that it lasts less than 90 minutes and, most importantly, Franco's performance. He makes up a lot of the ground lost by Boyle's directing hysteria. In this short a film, Franco creates a charismatic, rather distinct character almost from the moment he appears, thanks mainly to early scenes with others before he gets trapped. He manages to be good once he's confined as well despite Boyle's herky-jerky direction that keeps taking you away from his face. Since once he's caught, you basically have a one-man show, they add lots of flashbacks and hallucinations with other actors for him to interact with. He also gets to do monologues to the video camera, which I suppose serves as a better companion than Tom Hanks' volleyball did in Cast Away, though that was a better movie despite going on past the point where it should have ended. Boyle co-wrote the script with Simon Beaufoy, who won an Oscar for writing Slumdog Millionaire. Beaufoy also wrote The Full Monty. Was that a fluke? Boyle also brings back composer A.R. Rahman from Slumdog and his music doesn't add anything either, just making the already nutty direction seem more frenzied. 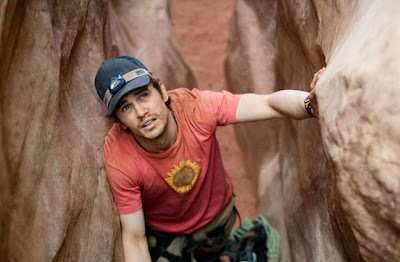 That James Franco manages to deliver such a fine performance in this mess is nearly as miraculous as Aron Ralston's real-life story of survival.